…meets Pineapple Upside Down Cake. Rum and pineapples and cashews and rum and cherries…and, did I mention…rum? Yes! And with the British Navy rum of choice, Pusser’s…kick the diet down the road one more day. …or buy it at a Pusser’s store. If you can find one. But a Galley Pirate likes to cook. And experiment. And take something that’s scrumptiously delicious and make it even better! And…if there’s a BIRTHDAY to celebrate, better yet still! But keep in mind, this cake should sit overnight to let all the flavors absorb. So plan ahead! Melt two tablespoons butter. In a small bowl place 1/2 cup brown sugar and add the melted butter, stirring to dissolve the brown sugar. Then stir in the pineapple chunks and set aside. Chop the 2/3 cup of nuts. Rum cakes typically have pecans, but this cake was for my skipper’s birthday and he can’t eat pecans (and peanuts will kill him!) so I thought cashews would help lend a tropical feel. Macadamia nuts would be an equally wonderful choice. Spray grease a bundt pan. Place maraschino cherries in the bottom of the pan, equally distant, in a nice ring. Spoon on the pineapple-brown sugar mixture, then sprinkle the nuts on top. Next, get ready to make the cake. Preheat your galley oven to 325 degrees. Cream the butter and sugar until light and fluffy. In a separate bowl, mix the dry ingredients: flour, powdered milk, baking powder and salt. Then add to the butter-sugar mixture and mix well. Pour into your prepared bundt pan, careful not to move all your maraschino cherries around. The maraschino cherries, pineapples and nuts will remain on the bottom of the pan. Place in your preheated 325 degree oven for 50-60 minutes or until a long skewer poked in comes out clean. I usually place cake pans on an insulated cookie sheet to keep the bottom from burning. When the cake is done, take out of the oven and let cool for 15 minutes while you prepare the rum sauce. Combine all the ingredients, except the rum, in a small sauce pan and heat through until the sugar is completely dissolved. Remove from heat and stir in the rum. Storm’s coming in this evening. I’d like to get the cake made before the boat starts rocking. The nice thing about storms on a sailboat…the rest of the world can be out of power, but you will still have yours! And your propane, too! 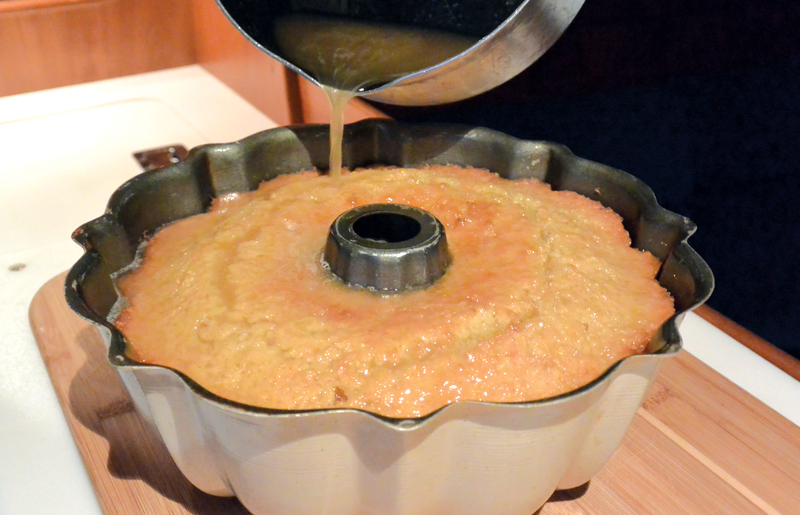 When the cake has cooled for 15 minutes, slowly pour the rum syrup over the cake. You may need to poke holes in the cake to help soak in the syrup. Then let it sit. And sit. Overnight is best. The next evening, start the BIRTHDAY CELEBRATIONS! Place a plate on top of the bundt pan and invert. It should come out of the pan in one heavy PLOP! with the consistency of a moist pound cake. Very important for ALL galley chefs!